Interview questions for consultants vary depending on the type of company for which you are applying. Consultant interviews typically include a mixture of behavioral and case questions. The more you prepare for the interview, the better you will do. One way to prepare is to practice answering common interview questions. Here is information on the types of interview questions you might be asked during an interview for a consultant position. Below is also information on how to prepare for an interview and a list of specific interview questions. Review the list and think about how you would respond to these questions in advance of your interview. Some of the questions you will be asked will be common interview questions you might be asked for any job. These might include questions about your work history, your strengths and weaknesses, or your skills. A consultant may work with one client at a time or with several, so expect to get questions about time management. 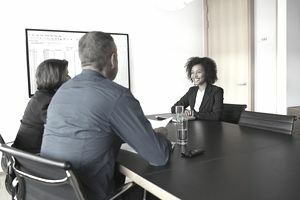 Since consultants are often brought on to evaluate and fix organizational challenges, you may also be asked questions that focus on your communication and problem-solving skills. You will also likely be asked a number of behavioral interview questions. These are questions about how you have handled various work situations in the past. For example, you might be asked how you have handled an issue with a difficult employer. Other questions might be situational interview questions. These are very similar to behavioral interview questions. However, situational interview questions are about how you would handle a future work situation. For example, an interviewer might ask how you might manage a project with a very tight deadline. The most common type of consultant interview question, however, is the case interview question. A case interview question is one in which the employer gives you either a business scenario or a brainteaser, and asks how you would solve the problem. These kinds of questions show the employer that you can use logic to solve complex problems. Case interview questions require some preparation. Ask friends or family members to give you as many practice case questions as possible. During the question, listen and take notes, asking any clarifying questions. Asking questions will help you think through the problem, and will also show that you are listening carefully. It will also help you engage with the interviewer, and establish a report. While answering a case interview question, say your thought process aloud and use a pencil and paper to work through the problem. While you need to provide an answer, the question is much more about assessing your thought process. Therefore, share your thinking out loud. Many of your case questions (as well as some of your other questions) will be related to the industry in which you will be working. Therefore, before your interview, make sure you are caught up on news about the industry. Don’t forget to practice the basics of good interviewing. Make sure you are prepared to give a firm handshake, make friendly eye contact with your interviewer, and smile when appropriate. Sometimes case interview questions can feel overwhelming, but don’t forget that you still want to be personable. You are consulting a small firm that sells a well-reputed product. A large competitor starts selling a similar product incorporating the most recent technology. What should the small firm do in response? How many tennis balls can fit in a football stadium? Estimate the size of the U.S. pencil market. How fast is the market for X growing? Your client is a snow plow company. The past two years have seen a reduction in snowfall by 20%. What would you suggest they do and why? Describe how you typically conduct a sales meeting. What kinds of consulting projects do you typically work on? What has been the focus of the last four or five projects you have worked on? What has been your average number of clients at a time? Do you tend to focus on one project, or do you handle a number of projects simultaneously? How do you keep track of your progress during a project? We want to achieve savings of 20% in the next 12 months. How can you help us reach this goal? What makes a good consultant in this industry? What do you see as the major issues facing this industry? What are some important ethical considerations for consultants? Why do you want to work for our consulting firm over other firms? Walk me through the life cycle of a recent project you worked on from start to finish. What results/deliverables did you achieve? What went well and what did not go well? Tell me about a time when you faced an ethical dilemma, and how you managed it. Tell me about a time when you had to deal with a difficult client. What did you learn from the experience? What would you do differently? Describe you had a time you had to lead a team through a difficult challenge. Describe a time when you were working for multiple clients at the same time. How did you keep from spreading yourself too thin? How would you explain a complex technical issue to a client? Imagine you had a difficult boss. How would you handle the situation? Tell me about a time you struggled to meet a deadline. How did you manage your time to complete the assignment?